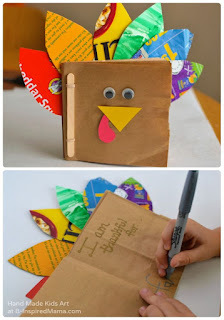 grandma's cookie jar: crafting with grandma - Thanksgiving Thankful Turkey Book! crafting with grandma - Thanksgiving Thankful Turkey Book! At any rate, as I browsed on Pinterest this morning, I found a great idea for a craft which will help my family think about what they are thankful for! I'm going to have my grandsons help me make a Thanksgiving, Thankful Turkey Book (you'll find all the simple directions at this link) and then after our dinner, each person will have time to decorate a page in the book to tell/show what they are thankful for this year! I think this would be a fun craft to make each year and then refer back to it throughout the year to remind ourselves of the many blessings God has given for which we can be thankful! Do you have any special plans/traditions for helping your family focus on being thankful at Thanksgiving?